Challenge the brain with this Alphadoku puzzle. Puzzle supports brain health and these puzzles are a great addition to curriculum planning for logical reasoning and problem-solving strategies. 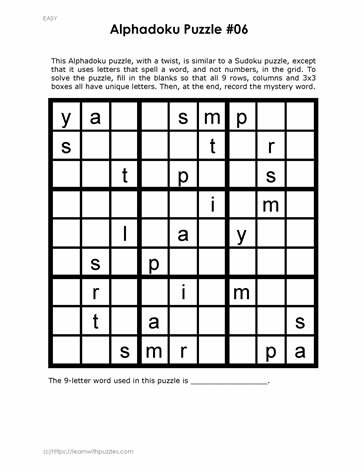 To solve these puzzles use the basic Sudoku rules and logical reasoning to fill in the blanks. Once the puzzle is solved record the nine letter word used in the puzzle.